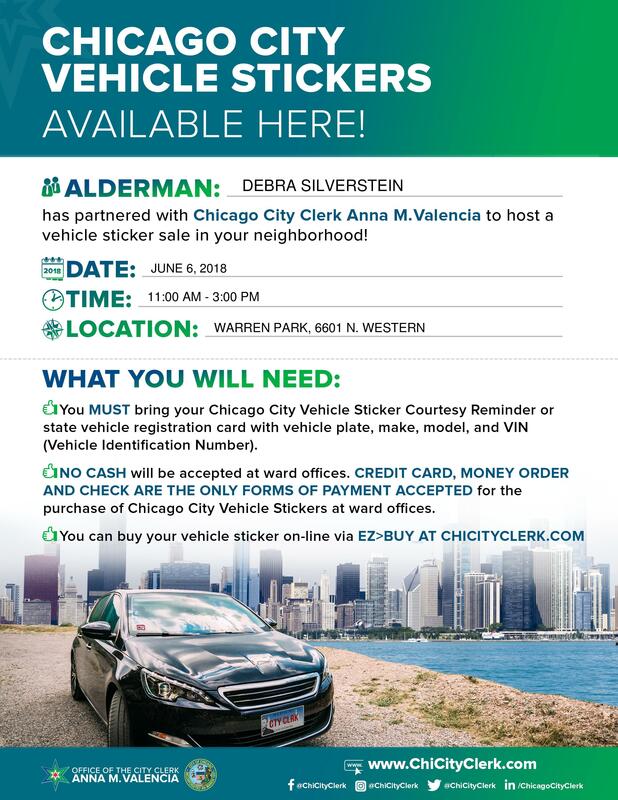 Please join me for my annual City Sticker Day this year on Wednesday, June 6 from 11 a.m. to 3 p.m. at Warren Park, 6601 N. Western. The City Clerk has moved to year-round City Sticker sales, so the only people eligible for the ward sale this year are those whose stickers expire in June. 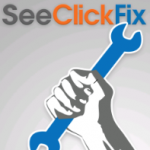 Please bring your City Sticker renewal form when you come to the sale. If you do not have a renewal form, you can also bring in your state vehicle registration card, which includes your Vehicle Identification Number (VIN). No cash payments will be accepted at the ward sale this year. Please bring a credit card, money order or check in order to purchase your sticker. Seniors are guaranteed a discount for one passenger or large-passenger vehicle, even if the discounted price is not reflected in the renewal form. 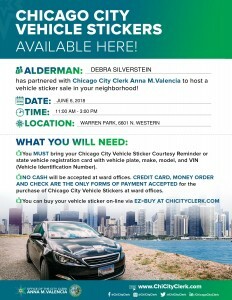 If you are a senior and your price for a single car is not listed as $30.59, we can help you on City Sticker Day. Bring your incorrect renewal form and a valid ID showing your age to Warren Park on June 6 and you will be able to purchase your sticker at the correct discounted price.